This paper considers whether the stability of Bitcoin in the market as a method of payment using a dual currency money-search model. In the model, there is traditional money and Bitcoin. The two currencies are classified by the storage cost and the probability that sellers accept particular money for payments. Agents are randomly matched for transactions. To consider substitution effect between monies, we allow new entries every period. In the beginning of each period, new entrants come into the matching process with a unit of money of their choice. A certain number of sellers also come into the same process to maintain the population share of sellers at a constant level. With appropriately chosen parameters, the author finds that there can be stable and unstable equilibria of the share of bitcoiners. In this case, a stable equilibrium is a success (bitcoiners take a large share) while the other (unstable) is a failure (bitcoiners take a marginal share or vanish). However, if the inflation rate of traditional money decreases, the successful equilibrium disappears to start approaching the failure even if Bitcoin is currently widely accepted. Furthermore, welfare comparisons suggest that an increase in the share of bitcoiners has a negative effect; hence, the benefit from reductions in the transaction costs must compensate for the welfare erosion if Bitcoin is accepted as a new kind of payment system. If the author is to succeed, the Bitcoin community or the public authorities need to be prepared for protecting the system from several illicit activities. Bitcoin, which was launched in 2009, is a math-based digital currency project operated by nongovernmental entities.1 Anyone can obtain bitcoins if he/she can solve a math problem (mining). The math problem gets harder as more coins are mined. The math problem is so hard that miners use computers for mining; hence, the money supply is constrained by the progress of computing technologies. Once a coin is mined, it can circulate as an ordinary coin within the internet. Bitcoins can also be exchanged with other currencies, such as Euro and US dollar (USD). For example, Figure 1 shows the exchange rate with USD at the Mt. Gox that shows a steady increase in its value: from almost zero to $100 in May 2013. Mt. Gox is a Tokyo-based Bitcoin exchange that deals with most of the Bitcoin exchange trades. According to this chart, it seemed that Bitcoin is heading toward the successful establishment of a new payment method beyond the control of any authority, until the crash of Mt. Gox in 2014 (some signals might have already been observed in 2013). 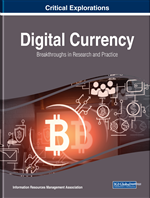 This paper studies Bitcoin (a legendary digtal currency) using a search-theoretic model of money. There are three major versions of money-search model: the first generation model that uses indivisible money and goods (Kiyotaki & Wright, 1989); the second generation model that uses indivisible money and completely divisible goods (Trejos & Wright, 1995); and the third generation model that uses completely divisible money and goods (Lagos & Wright, 2005).4 This discussion is based on the second-generation money-search model. We extend the basic model by Trejos & Wright (1995) to a dual-currency model as Craig & Waller (2000). The reason to use the second generation model is its simplicity for extension and its capability of dealing with price differences in methods of payments. In the dual-currency system, there are two currencies coexisting in a unified market as methods of payments. For keeping the seller to buyer ratio constant, this paper allows new entries of sellers and buyers. Accepting new entrants, who observe the previous period’s market performance of each currency, allows correlations among parameters within each currency, and eventually an interdependence of shares of traditional money and Bitcoin users. With such a framework, we examine if Bitcoin can stay in the market as a method of payment. In addition, we consider dynamic stabilities of bargaining outcomes and population shares of respective agent types. It is then clarified that Bitcoin may fail to exist if the inflation rate is sufficiently low relative to the storage cost (or gain) of Bitcoin. Actually, the financial crisis in Europe has brought the focus on Bitcoin. To overcome such a time on the cross, bitcoiners may have to accept major financial institutions to get involved in the community.